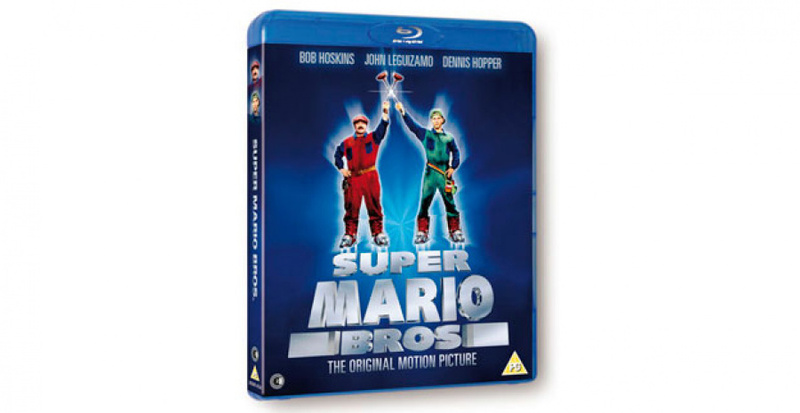 Yesterday we posted that everyone’s favourite plumber's live action big screen adventure Super Mario Bros gets its long-awaited UK Blu-ray release in November. With an all-star cast, including the legendary Bob Hoskins alongside John Leguizamo and Dennis Hopper, not only does this madcap caper get the high-def treatment on Blu-ray, it also comes complete with a slew of intriguing bonus features. We've learnt that a brand new 60 minute documentary entitled This Ain’t No Video Game will also be included in this release. This appears to be very comprehensive and features all new interviews with co-directors Rocky Morton and Annabel Jankel, Producer Roland Joffe, Actors John Leguizamo and Richard Edson, Writer Parker Bennett, Production Designer David Snyder, Art Director Walter Martishius, FX Artists Paul Elliot, Vincent Guastini and Rob Burman, Visual FX Designer Chris Woods, Editor Mark Goldblatt and Creature Designer Patrick Tatopoulos. In addition to this there are archive interviews with the late Bob Hoskins and Producer Jake Eberts. The Super Mario Bros Blu-ray will be released in the UK on the 3rd of November, will you be pre-ordering a copy of this slice of cinematic history? I have never seen this film. I have heard its pretty bad. However it maybe so bad that its good? The extra documentaries maybe worth a watch. Good to see this odd little gem is getting an HD treatment, now if only The Wizard could get a Blu-Ray release. This film was awful at the time i remember seeing it when it first come out it was so od seeing mario stars as humans like bowser. Only saw this firm three times. Once, when I was a kid, thought it was kind of cool. Second, when I'm older, rewatched and went: "Was it this cheesy when I was a kid? ", and third, rewatching it during a funny commentary from my favorite group. Everything about that movie was wrong! I always wondered why Luigi never had a moustache. I've seen worse movies though. I enjoyed this flick back in the day, and if being plunked into the position of having to watch this 10x in a row Vs playing Hyrule Warriors i'd choose the former. It's one of those movies that is truly a train wreck but it is actually quite a fun watch. This movie is a true classic. Sadly, in my book this is one of the better film adaptions of a video game since they are always so bad. I mean...making a live action Mario movie should never have happened. But it did and all things considered, i think they did a pretty good job making the insanely wacky story of Mario into a cohesive, (semi) believable story. I wanna watch it again now! I like it, especially in terms of context (only the first game existed) and world building. My favorite detail is that since dinosaurs never went extinct, the cars are all Mad Max style electric bumpercar vehicles! Its goofy, not bad. It won't win any quality awards but its still quite fun to watch. I love the film. It's trashy fun and very creative. I think people just have the wrong expectations because it's Mario Bros.
@Daruncic There had been several Mario games prior to the movie. @Mario500 OH! So you're right! I was always under the impression that the movie was made in 1989. My bad. Still didn't have a LOT to go off of aside from "Dinosaur man kidnaps princesses"
@Trikeboy Yeah, I know its a bad movie, but it is still enjoyable. I can't wait to see Big Bertha flying around in HD!! i'll buy this... and sell it for twice as more money so i can get a good mario title. I remember thinking Daisy was hot... and that the plotline of the meteor hitting Earth was fairly well done... but there's a reason this films stands as a great example of how to NOT handle a game franchise. Still, it's got a following. Like Howard the Duck. I don't think I've seen this since like 1994. As a kid, I saw it was so obviously non-canon that I hated the movie for tarnishing the Mario name. The Wizard was like an academy award winner compared to Mario Bros.
As for the behind the scenes content, I wonder if it has Bob Hoskins saying, "The worst thing I ever did? Super Mario Brothers. It was a f******nightmare.The whole experience was a nightmare. It had a husband-and-wife team directing, whose arrogance had been mistaken for talent. After so many weeks their own agent told them to get off the set! F****** nightmare. F****** idiots." why do crap movies like these keep getting rereleaseed? LET THIS FILM DIE IN PEACE!!!! So THIS gets a Bluray release and movies and series 10 times better don't? What the f**** is this world coming to? @kupo Couldn't agree more. Bob Hoskins would probably turn in his grave if he knew this was getting a Bluray release. @kupo I dont know cos I aint seen the film but if the extras are like how you describe them id buy the movie for that. who are the married couple?